This cake was amazing. For real, if you celebrate Thanksgiving tomorrow and you're scrambling for something to bring, make this. 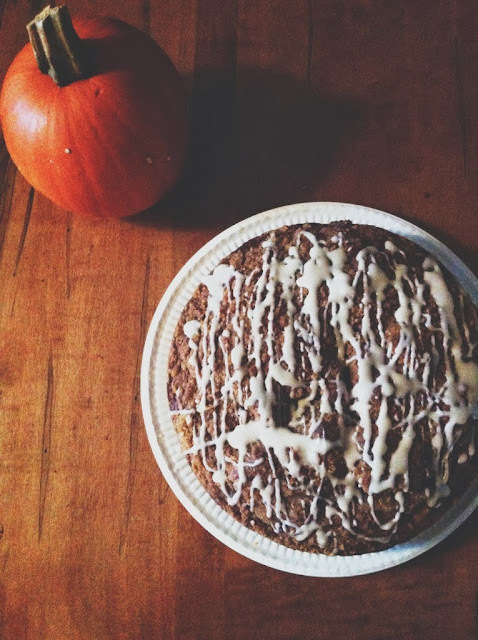 I saw it on Buzzfeed and subsequently tagged it to my 'to bake' board on Pinterest and magic happened. Thanksgiving is my favourite holiday. 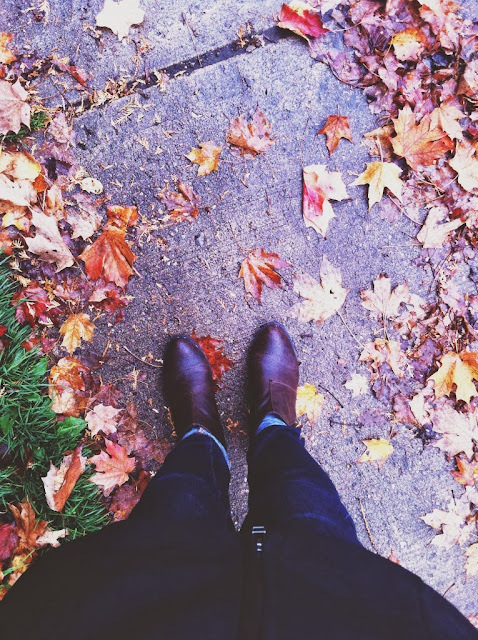 I dig October, from the leaves to the colours to the weather. Not to mention all recipes include some form of pumpkin. Most importantly, it's the one holiday where almost all of our family is here to celebrate. Christmas is tricky because everyone travels from a distance and the weather can throw you a curve ball, but Thanksgiving almost always guarantees a full house which always yields a great time. My mom comes from a family of 6 kids, each married and each with their own kids so when we all get together the house is echoing with voices. The Mom's always pull out all the stops to make the side dishes and fixings and the turkey and make sure all of our hungry mouths are fed on time. We usually all gather around lunch time and have appetizer type foods then we let it all digest before we dig into the turkey around dinner time. I have seven cousins, ranging from 10-28, plus my sister and I, so this year we decided it was our time to tackle the lunch hour nibbles and produce some delicious noms to give our Mom's a break! That's where this cake comes in. I was stumped for a few weeks as to what to make. I scoured foodgawker and my Pinterest board for appetizers we've never tried but I kept coming back to this cake. I can't even put in to words how delicious it was. I heard nothing but compliments all afternoon about how it turned out, which is why I can't wait to share it with you. so iPhone photos will have to suffice! I didn't manage to get a picture of the insides because I ate it too fast but let me tell you, it was dense, moist and had the perfect amount of 'spice' so to say to finish it off. If you take anything from any of these posts on here, make it this one. MAKE THIS CAKE. Now onto the recipe. Adapted from Portuguese Girl Cooks. Preheat your oven to 350*F and butter a 9-inch springform pan. To make the streusel: in a small bowl, combine flour, brown sugar, cinnamon and salt. Add in the pieces of butter and using a pastry cutter or 2 knives, cut the butter into the flour mixture until coarse crumbs are formed. To make the cake: in a medium bowl, whisk together flour, baking powder, baking soda, cinnamon, ginger, nutmeg and salt. In the bowl of a stand mixer with the paddle attachment, beat the butter and brown sugar on medium-high speed until well combined. On low speed, beat in the eggs one at a time. Add the pumpkin and sour cream and mix on low speed until everything is combined. Fold in the flour mixture by hand - but you've been warned, the batter will be very thick! Evenly spread the cake batter in the cake pan and top with the streusel. Bake for 50 minutes or until a toothpick comes out clean. Cool in the pan on a cooling rack for 15 minutes, then remove from pan to cool. For the glaze: in a small bowl, whisk together the powdered sugar, milk and vanilla. Whisk until smooth and drizzle over cooled cake. I hope everyone had a wonderful day celebrating with those that are important to you. I'm certainly thankful for new beginnings, my incredible family and the excitement of what's to come in the upcoming year. Happy Thanksgiving!